This year, STRYPER.COM is celebrating 20 years on the world wide web! We first launched in April of 1999 by Brett Christensen and Craig Erskine. Jeff Wollschlager has been the sites webmaster since March of 2013. Throughout the year we will be celebrating with some exclusive content but we are kicking things off with something amazing! Before the major label record deals; Before multi-platinum albums; Before chart-topping videos; Before history was made... there was Roxx Regime. In 1983 brothers Robert and Michael Sweet teamed up with high-school classmate Oz Fox and local bassist Timothy Gaines to form a band that would forever change the history of Christian rock music. The four guys released a demo under the name Roxx Regime and started playing the local Hollywood club circuit. This band eventually caught the ears of Enigma Records and soon afterward would change their name to Stryper and release their first national album, The Yellow And Black Attack. Stryper would go on to sell millions and millions of records and tour the world sharing their music and their faith. Before all of this however, there was The Roxx Regime demo. There are no over-dubs or re-recordings. This is the way Stryper sounded, before they were Stryper; raw, natural, and destined to change the history of music. These demos were previously released on July 7, 2007 (7-7-7). To celebrate the 20th Anniversary of STRYPER.COM, we are re-releasing the Roxx Regime Demos… on vinyl! The album will feature the eight original tracks… plus three alternate demos that have never been released! Production is limited to only 1,000 copies and features new cover artwork. This extremely limited-edition release is also pressed on colored vinyl! The vinyl color is completely random. Colors, shades and opacities will vary from one record to the next. Since these records are sealed in shrink-wrap, we do not know what colors are available nor what color customers might receive. 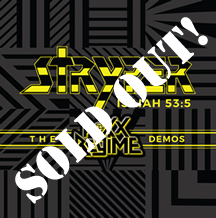 In addition, STRYPER.COM will be releasing an Stryper Limited Roxx Regime T-shirt!